The main star in Fantasy Zone is a little space ship that goes by the name of Opa-opa. What’s special about Opa-opa is that it is a living ship. It flies through the air using a couple of white wings and when it goes down to ground level it precipitates a couple of legs at the bottom to make it run around freely on the ground. FZ is often referred to as a Cute’em up. That means it’s basically a shoot’em up where everything is prettier and sweeter than normal. Kawaii, light and fluffy are keywords for this sub-genre. Other examples are Pocky & Rocky(SNES) and Parodius(NES). 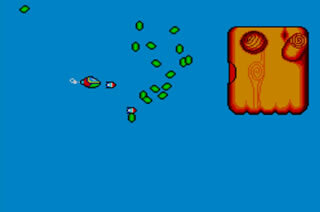 For a long time FZ was the undisputed champion among horrible games when it came to graphics and choice of colour palettes. And that’s no small thing considered that I used to bash the Nes for exactly the same thing. Sega however had this game that easily took the prize. It almost hurt my eyes looking at it. When I re-visit this fantasy zone today I quickly discover that it really only is the first two levels that look really horrible. The rest of the levels range from nice to acceptable. For once I also notice that the Master System version isn’t the best graphics-wise even though it’s far from Tengen’s awful Nes version. But please be prepared for a lot of pink regardless of the version you end up playing. A common thing about shoot’em ups from this era is that you generally fly forward at a set speed. In FZ however you go either left or right and the player is in full control except for the tiny detail that the ship can never come to a complete stop. Pressing left or right on the control pad gradually increases the speed and when you release it the ship slows down to a minimum. This sounds easy enough but it’s really a bit difficult to get the hang of. On the other hand it gives the game a high tempo since a constant movement never lets you breathe. It may not sound different from many other shmups but believe me, being able to change direction and the ship’s tireless momentum makes this something very different. And when you finally get the hang of it you have a control that’s far superior to games like 1943, Gradius or R-type. Opa-opa is equipped with two weapons. A projectile weapon that’s mostly going forward and a bomb that attacks targets on the ground. Killing enemies gives you money as a reward and the tougher the enemy the more money you get. Half-way through every level a store appears where you can buy upgrades to your ship. The sad part is that the upgrades are not permanent and disappears after a while. Considering the coins received for killing enemies and the possibilities of upgrading your ship it’s hard to not notice the similarities with the Psygnosis classic Blood Money (Amiga, Atari ST, C64). It doesn’t seem entirely unlikely that the team at Psygnosis were inspired by FZ even though Blood Money is a much darker story, far off from the cheerfulness and cutesy of Fantasy Zone. There’s usually bosses at the end of levels in shmups and FZ is no exception. In this game they are the highlight of every level. They are big and beautifully designed and every single one has a unique weakness that you have to figure out in order to beat it. In fact, the bosses are so much fun compared to the rest of the game that the levels soon start to feel like a long tedious road towards the next boss. Thankfully the levels are fairly small. In the end FZ comes across as a shmup in a high tempo, with a different graphical style that’s an enjoyment to pick up and play. The learning curve is excellent as well as the difficulty level throughout the game. I recommend it to all you action fans out there. On Master System there’s few real competitors and regarding other versions I only put up the warning sign above the MSX and NES versions. Opa-opa has been a kind of unofficial mascot for Sega over the years. The little ship has appeared one way or the other in games like Alex Kidd, Golden Axe, Phantasy Star IV and Space Harrier. The last one is interesting because it begins with the spoken phrase ”Welcome to the Fantasy Zone. Get ready!” which seem to indicate that it is set in the same universe as FZ. 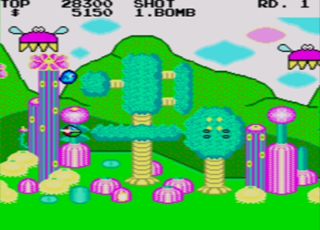 There was even a game being developed for the Turbografx-16 called Space Fantasy Zone that would connect the two game series once and for all. Unfortunately NEC never got the permission needed from Sega and the game was never released.